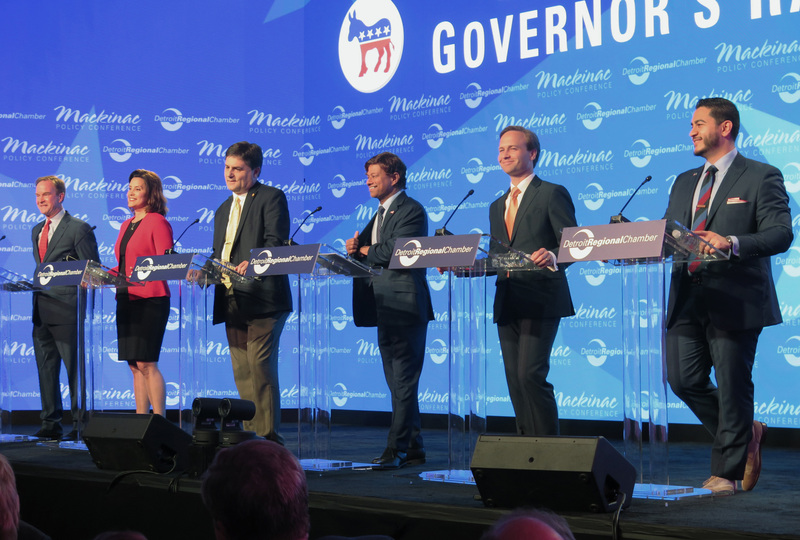 MACKINAC ISLAND, Mich. — Michigan’s major-party gubernatorial candidates met Thursday night for their only joint debate, offering contrasting answers to questions about roads, education and other topics that fell largely along party lines two months before the August primary. There were few sharp exchanges in a format that often saw two candidates from opposing parties responding to inquiries from the moderators. The three Democrats — Gretchen Whitmer, Shri Thanedar and Abdul El-Sayed — criticized term-limited Republican Gov. Rick Snyder’s record on issues such as the Flint water crisis and the state of public schools. Thanedar and El-Sayed also lamented the influence of corporations on politics before a pro-business crowd at the Detroit Regional Chamber’s annual policy conference. Republican Lt. Gov. Brian Calley, who touted economic gains during his time alongside Snyder, said the state “has come a long way” and emphasized plans to boost workforce development. His GOP rival, Attorney General Bill Schuette, often focused on his proposals to cut the state income tax and auto insurance rates. “Fix the damn roads,” Whitmer said more than once during the hourlong televised debate, saying she has a $3 billion infrastructure plan. She also criticized Schuette for going to court to argue that Detroit schoolchildren have no constitutional right to literacy. Schuette, meanwhile, said there is no bigger contrast in the race than there is between his vision and the Democrats’ views. “Their answer is more taxes, more rules and more regulations, which is a sequel to the failed governorship of Jennifer Granholm,” he said, referencing the Democrat who left office more than seven years ago. All the candidates were asked about big items such as infrastructure and education. Others questions about the Flint emergency, economic development incentives and twin oil pipelines under the Straits of Mackinac were limited to some candidates. Asked to provide specifics on how to finally fix Michigan’s deteriorating roads and how they would fund it if not through higher taxes, one Republican pointed to a $1.2 billion plan enacted in 2015 that is being phased in. “You’re going to see more construction this year than maybe you’ve seen over the course of your entire life,” said Calley, adding that the Snyder administration is paying off debt that — once it is retired — would free up $200 million more for roads. State Sen. Patrick Colbeck, the third GOP candidate, said there is no need to raise taxes to fix the roads and that the state must transition to higher-quality roads that last three to four times longer. Schuette called for a “compete review” of the state Department of Transportation operations, eliminating a law that requires higher “prevailing” wages to be paid on state-financed construction projects and combing the budget for money so taxes are not hiked. Calley said while he favors the prevailing wage law repeal, it would “not impact the cost of our roads unless we see a change in Washington” — an apparent reference to a similar law at the federal level that applies to many state road projects. Whitmer, who wants to create an infrastructure bank funded through “user fees” or voter-approved bonds, said too many people have been sidelined due to a busted tire rim because of terrible roads. The businessman Thanedar said he would boost road funding by raising the corporate income tax and the personal income tax on the wealthy while eliminating the tax for people making less than $50,000. “We need to make a U-turn from the corporate welfare that’s been practiced in the last seven years,” he said. El-Sayed, Detroit’s ex-health director, said “our roads have never been worse. Our state is literally crumbling. … The big businesses here keep getting tax breaks.” He said he would create an infrastructure bank — which he has previously said he would fund with a combination of increased gasoline and diesel taxes and higher registration fees for farm and log trucks. El-Sayed agreed that he and Schuette have different visions, drawing laughter when he quipped that President Donald Trump has endorsed Schuette — a point that Schuette has hammered often in the GOP primary campaign.